When you would walk through the Room or visit Elaine at her Pop-Up Sales, we urge you to take your time as there is so much to discover. Our customers often used to go through the warehouse several times, as it was easy to miss a special item the first time around. The same is true of the new Room With A Past events. If you really want to enjoy our sales, bring your friends and family. March 2016 - Flea Market Style Magazine has listed Room With A Past as a shopping favorite! We are thrilled to be on the list once again! 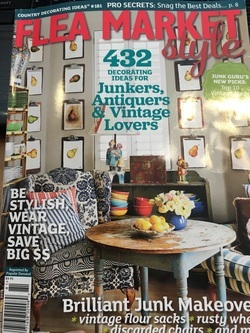 November 2015 - Recently mentioned by Flea Market Style DECORATING Magazine as the readers shopping favorite! We are thrilled to be on the list for the State of California.